This morning was clear, cold and sunny. We rode 15km before stopping in the small village of Worlitz for coffee and kuchen at the bakery. We joined the Elbe Radweg and soon came to the Elbe itself. The river has a wide floodplain and high flood levees. There were massive floods here in 2013. There are many cycle routes, some of which double up, so we were also on the Luther Radweg as we approached Lutherstadt Wittenberg. The 500 year anniversary of Martin Luther’s reformation is coming up in 2017 and they are busily cleaning up and restoring things in preparation. There is a lot of Lutheran tourism with groups going around town in pretend trains. A devout looking group with headscarves and guitars appeared about to burst into chorus when the cathedral bells got going and defeated them before they could get started. A man came up to me with a pamphlet and gave me a spiel about Jesus, but when I explained that I couldn’t speak German he gave up immediately. Wittenberg is also famous for a school that has been Hundertwasserised, so we went to see it. Gropius one day, Hundertwasser the next. A train ride was needed to get us back on the program, and at the Dresden hbf we once again observed a heavy police presence to keep a relatively small group of football fans in line. Polizei easily outnumbered the football fans – an expensive operation. Dresden is full of people walking and riding through the city, old and new, and along the Elbe. 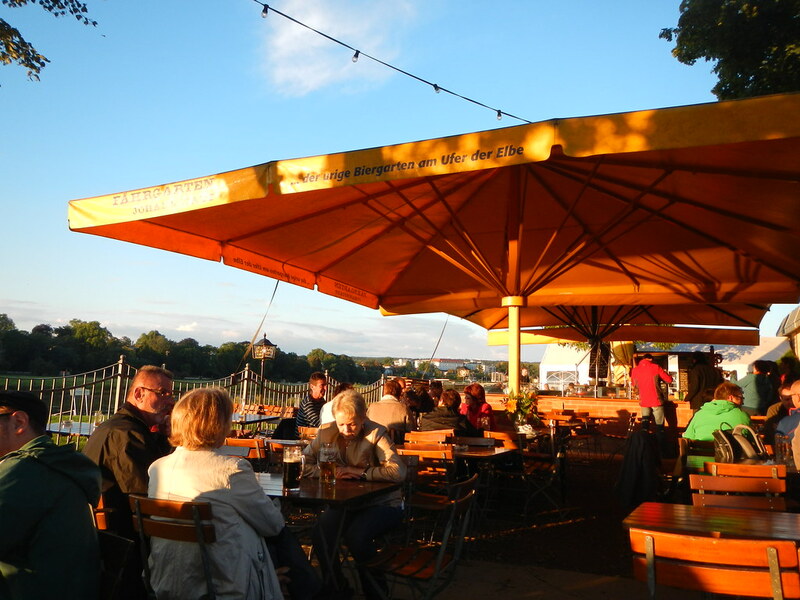 The temperature is mild, perfect for a beer and a wurst with mustard and potatoes at the Fahrgarten Johannstadt, river flowing by and sun going down. This entry was posted on 27 August 2014 at 7:03 pm and is filed under Europe 2014. You can follow any responses to this entry through the RSS 2.0 feed. You can leave a response, or trackback from your own site.